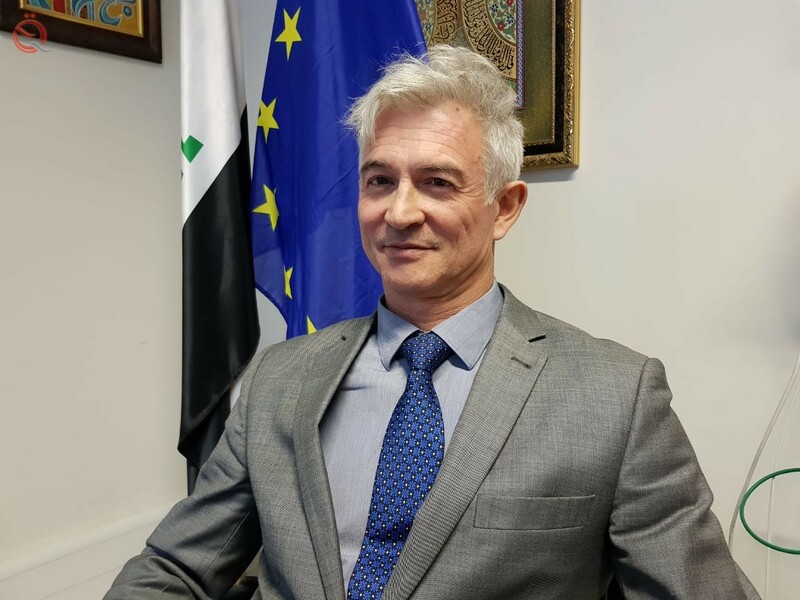 confirmed the European Union 's ambassador to Iraq, Ramon Blicua, that the Union had an important role in the Kuwait conference donated 400 billion euros for the reconstruction of theliberated areas, pointing to the existence of two agreements will be signing between Iraq and theUnion. In an interview with the Iraqi Economic and Political Center, Blikwa said in an interview with the Iraqi Economic Center that the financial grants granted by the Union to Iraq go to important projects, which are often in the context of reconstruction. He added that the European Union signed several agreements related to the management of public finances, noting that "the last agreement signed with Iraq was in December and two agreements will be signed in the near future, the first will focus on the reconstruction of Mosul and the second to find employment opportunities for residents of the plain Nineveh". He added that "Iraq does not owe to the European Union any amount and the Union is keen that the grant to Iraq be a grant so as not to overload the economy does not affect," noting that "companies operating in Iraq, in the fields of oil, gas, energy and trade, belonging to European countries and not For the European Union and the latter works with Iraq within the framework of the agreement of cooperation and partnership. " "The obstacles facing the work of companies are the same facing the work of the private sector in Iraq or any foreign company wants to work, because the economic policy is a central policy of the private sector faces many difficulties as well as corruption and mismanagement of financial management And public resources, and yet we see a significant improvement and there is a desire for reform, especially in the new government. " With regard to the EU's position on the recovery of those accused of corruption in Iraq, Blakwa stressed the existence of cooperation by the Union in this matter, but must be preceded by "an international request submitted by the Iraqi government," noting that the EU's 2019 plan puts in priority " To develop the partnership between Iraq and the European Union and strengthen this cooperation, especially in areas already worked on, such as reforming the security situation, providing services, supporting governance and managing public finances. " "The financial and monetary reform needs, among other things, an effective financial market. This is based on two aspects: the first is public financial management and the second is the creation of clear rules, regulations and laws for the private sector and foreign companies. There are many things that are not clear in the laws of these companies, "The government is working on joining the New York Treaty, which is working in this context," he said. Permit the recognition and enforcement of foreign arbitral awards in Contracting States ( Articles III, IV, V, VI and VII ). Sentences that have not been made in the territory of the State where execution is sought are considered "foreign". The Convention also applies to the recognition and enforcement of "non-national" awards; that is to say, sentences that have been issued in the territory of the State where their execution is requested, but that the law of that State qualifies as "foreign", in particular in the presence of an extraneous factor ( Article I (1)). One of the main achievements of the Convention is the abandonment of the condition of dual exequatur, which required the recognition of the arbitral award in the country in which it was rendered before it could be executed abroad. The official text of the Convention is available in Arabic, Chinese, English, French, Russian and Spanish ( Article XVI ) 1 . The International Court of Arbitration of the International Chamber of Commerce (or "ICC") 2 drafted a draft Convention on the Recognition and Enforcement of International Arbitral Awards ("The Preliminary Draft Convention"), which it presented in 1953 to the United Nations Economic and Social Council (ECOSOC). The draft ICC was aimed at the recognition and enforcement of "international" arbitral awards. In 1955, ECOSOC took over the project and made changes to it by making it applicable to "foreign" arbitral awards. By resolution 604 (XXI) adopted on 3 May 1956, ECOSOC decided to convene a conference of plenipotentiaries to adopt a convention on the recognition and enforcement of foreign arbitral awards. The Conference was held from May 20 to June 10, 1958 in New York at the United Nations Headquarters. Opened for signature in New York on 10 June 1958 and until 31 December 1958, the "Convention on the Recognition and Enforcement of Foreign Arbitral Awards" was signed by twenty-four states 3 . It came into force on June 7, 1959.
" The 1923 Geneva Protocol Relating to Arbitration Clauses and the 1927 Geneva Convention for the Execution of Foreign Arbitral Awards shall cease to have effect between the Contracting States of the day, and to the extent that they become bound by this Convention ". The preparatory work of the Convention can be found on the website of the United Nations Commission on International Trade Law (or "UNCITRAL") 4 . According to Article I (1) : " This Convention shall apply to the recognition and enforcement of arbitral awards made in the territory of a State other than the one in which the recognition and enforcement of awards are requested, and arising from disputes between natural or legal persons. It also applies to arbitral awards which are not regarded as national awards in the State in which their recognition and enforcement are sought . In addition, Article I (2) provides that: " Arbitration awards are not only the awards made by arbitrators appointed in specific cases, but also those rendered by permanent arbitration bodies to which parties have submitted ". The New York Convention has 156 Contracting States as of 19 June 2015. Since 2014, the Convention has seven new Contracting States: Burundi (2014), Bhutan (2014), Guyana (2014), Democratic Republic of Congo (2014). ), the State of Palestine (2015), the Union of Comoros (2015) and Andorra (2015) 5 . The processes of signature, accession and ratification of the Convention are governed by Articles VIII and IX . Can become a Contracting State any Member State of the United Nations and any State Member of a United Nations specialized agency or party to the Statute of the International Court of Justice, or which has been invited by the General Assembly of the United Nations United. The State must deposit an instrument of accession with the Secretary of the United Nations, or ratify the Convention and deposit the instruments of ratification with the latter. The territorial application of the Convention is governed by Article X . Any State may, at the time of its accession or ratification, determine and / or modify the scope of application of the Convention in its territory in accordance with the provisions of Articles X (2) and X (3) . The Article XIII provides an opportunity for a State Party to denounce the Convention under certain conditions. In choosing to make a reservation of reciprocity, a Contracting State admits that the Convention will apply only to the recognition and enforcement of awards made in another Contracting State. Where a Contracting State makes no reservation of reciprocity, it agrees to recognize and enforce foreign arbitral awards, whether made in a Contracting State or not. In practice, it is necessary to determine (i) the State where the arbitration award was made and (ii) whether that State is a party to the Convention. The nationality of the parties to the arbitration will not be taken into account. A Contracting State may still grant recognition and enforcement of an award made in a non-Contracting State on the basis of other rules than the New York Convention. The commercialization reserve allows a Contracting State to "declare that it will apply the Convention only to disputes arising from legal relationships, whether contractual or non-contractual, which are considered as commercial by its national law". The Article II (1) requires contracting states to recognize the arbitration agreement under which the parties undertake to submit to arbitration disputes " or certain disputes which have arisen or which may arise between them in respect a definite legal relationship, whether contractual or non-contractual, relating to a matter that may be settled by arbitration ". Under Article II (2) , the arbitration agreement must be in writing. It may be an " arbitration clause inserted in a contract, or a compromise, signed by the parties or contained in an exchange of letters or telegrams ". In its Recommendation adopted in 2006 on the interpretation of Article II, paragraph 2, and Article VII, paragraph 1, of the New York Convention, UNCITRAL recommends " that paragraph 2 of article II of the Convention on the Recognition and Enforcement of Foreign Arbitral Awards, done at New York on June 10, 1958, recognizing that the cases described therein are not exhaustive " 7 . The Convention gives full effect to arbitration agreements pursuant to Article II (3) which reads as follows: " The court of a Contracting State, seized of a dispute over a matter in respect of which the parties have entered into an agreement for the purposes of this Article, shall refer the parties to arbitration, at the request of one of them, unless it finds that the agreement is obsolete, inoperative or not likely to be applied ". In accordance with Article III , the recognition and enforcement of a foreign arbitral award in the country in which it is invoked shall be governed "in accordance with the rules of procedure followed in the jurisdiction in which the award is made ". In addition, " [t] here is no requirement for the recognition or enforcement of arbitral awards to which this Convention applies significantly more stringent conditions or substantially higher court fees than those imposed for the recognition or enforcement of national arbitral awards ". A party wishing to obtain recognition and enforcement of an arbitral award in a State must make application to the courts of that State and provide: (i) " the duly authenticated original of the award or a copy of that original fulfilling the conditions required for its authenticity "( Article IV (2) (a) ); (ii) " the original of the agreement referred to in Article II, or a copy fulfilling the conditions required for its authenticity " ( Article IV (2) (b) ); and (iii) a certified translation of the award and / Convention in the official language of the country in which the award is if the award or convention is not in an official language of the country in which the award is made "( Article IV (2) ).
" (A) That the parties to the agreement referred to in Article II were, by virtue of the law applicable to them, incapacitated, or that the said agreement is not valid under the law to which the parties have made it subordinate or, failing an indication in this regard, under the law of the country where the award was made; or(b) That the party against whom the award is made has not been duly informed of the appointment of the arbitrator or the arbitration procedure, or that it has been impossible for him for any other reason to claim his means; or(c) That the award relates to a dispute not contemplated in the compromis or which does not fall within the provisions of the arbitration clause or contains decisions which go beyond the terms of the compromis or arbitration clause, however, if the provisions of the award that relate to matters referred to arbitration may be dissociated from those that relate to matters not submitted to arbitration, the first may be recognized and enforced; or(d) The constitution of the arbitral tribunal or the arbitration procedure has not been in accordance with the agreement of the parties, or, failing agreement, that it has not been in accordance with the law of the country where the arbitration took place; or(e) That the sentence has not yet become binding on the parties or has been annulled or suspended by a competent authority of the country in which, or by whose law, the award was made ". Under Article VI , a party may seek the annulment or suspension of such enforcement by the competent authority of the country in which, or by whose law, the award was made. In the meantime, if the other party tries to enforce that decision abroad, the authority before whom the award is relied may, if it deems it appropriate, (i) stay the proceedings on the execution of the decision. award, and / or (ii) at the request of the party seeking enforcement of the award, order the other party to provide adequate security. The Article VII (1) provides that " The provisions of this Convention shall not affect the validity of multilateral or bilateral agreements concluded by the Contracting States concerning the recognition and enforcement of arbitral awards and not deprive any interested party the right it may have to avail itself of an arbitral award in the manner and to the extent permitted by the law or treaties of the country where the award is relied on ". Since the provisions of the ordinary law of the State in which enforcement is sought or of another international instrument binding that State are more favorable to the enforcement of the sentence than the provisions of the Convention, the party requesting the enforcement can do so on the basis of these provisions. This clause is often called "the most favorable clause". Since its adoption in 1958, thousands of court decisions have interpreted and applied the New York Convention in the Contracting States. To eliminate or minimize the effect of legal inconsistencies in the interpretation and application of the Convention of New York, many books and studies have been published since thirties 9 . In 2008, the ICC published a guide to the national rules of procedure for the recognition and enforcement of arbitration awards, which was updated in 2012 10 . There are, country by country, the procedural rules for the recognition and enforcement of foreign arbitral awards. At its 41 th session in 2008, UNCITRAL requested its Secretariat to explore the possibility of developing a guide on the New York Convention to promote uniform interpretation and application of the text in order to avoid uncertainties imperfect or partial implementation and to reduce the risk of State practice deviating from the spirit of the Convention. During the 44 th and 45 th UNCITRAL sessions in 2011 and 2012, the Secretariat informed the Commission that it was pursuing the drafting of a guide to the Convention, in close cooperation with Professors Emmanuel Gaillard (Associate Professor of Law Schools, Emmanuel Gaillard teaches international arbitration law at Yale Law School) and George Bermann (Columbia University School of Law) 11 .